Lobsters have long been part of New England culture and lore. But how much do you know about lobsters' social lives? Turns out they are not so neighborly. The orange lobster was featured in our fall colors post a couple weeks back, for obvious reasons. Lobsters can be aggressive and territorial, each claiming a secretive dwelling among the nooks and crannies on the ocean floor. After a skirmish, a dominant (usually larger) lobster claims the top spot in its realm of influence. Other lobsters usually stay out of its way and avoid future confrontation. Looks like the beautiful blue lobster knows its place in the lobster exhibit at the Aquarium. Watch it avoid the orange lobster as it skulks around the exhibit looking for a fight! Upstairs from this exhibit in the Aquarium's research laboratory, scientists are working hard studying lobster shell disease. Researchers are also working to understand the science behind lobster shell colorations. Some genetic mutations create wild colors! Other shell colors can be determined by a lobster's diet. Those colors are on display in our lobster nursery in the Blue Planet Action Center. 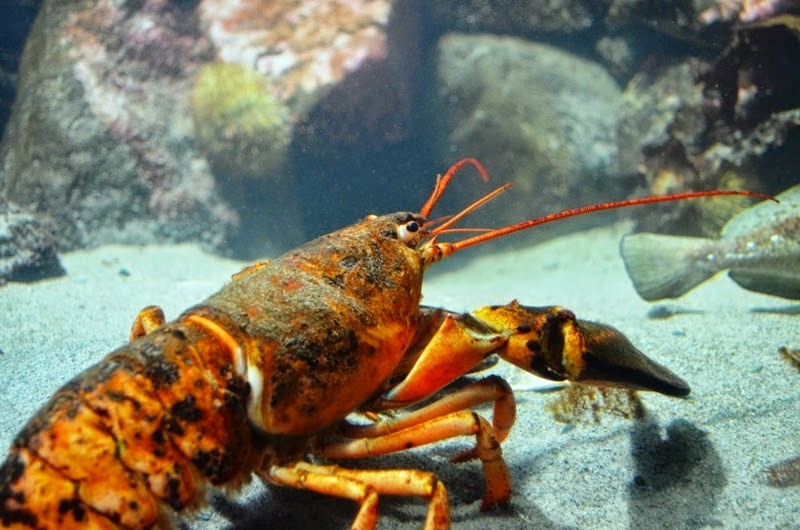 Come visit the Aquarium because there's probably a lot of lobsters that you don't know yet!